Microhard NMS (Network Management Software) served based application to monitor, troubleshoot and perform centralized upgrade and configuration operations for Microhard Cellular Modem networks. 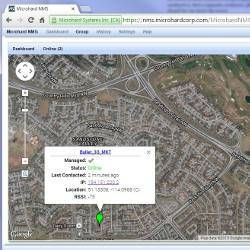 Includes map with GPS coordinates of devices, SMS & Email Alerts and Event logs. Microhard NMS (Network Management Software) is a powerful server based application that allows multiple users to graphically, monitor, troubleshoot and perform centralized upgrade and configuration operations for Microhard Cellular Modem networks. Locations of the units in the network can be positioned on a detailed map interface with precise GPS coordinates. The entire network status can then be monitored and diagnostics can be used to prevent, identify and resolve problems. View status of radios by groups or location. The NMS Dashboard provides a snap shot of the network health and status, allowing users to quickly take stock of online and offline units. Device grouping allows to segregation of devices by type, carrier, network, project, geography etc for easy identification. Simple to navigate device tree and grouping folders for easy device selection. The detailed view device summary shows information such as the MAC and IP Addresses, Device Name, Carrier, SIM, Service & Radio Type, Ec/No, RSSI/RCP, Device Status. Quick link to specific device�s WebUI Configuration. Powerful Filter to show only devices of interest. Map View allows robust mapping capabilities using GPS coordinates, with color coded icons for easy to view device status. Detailed information for each device in contact. Device Details provide general information about the device such as hardware & firmware versions, date/time last contacted, configuration details. Carrier details provides current APN, Call Status, Roaming info, Cell ID, SIM Card Info, Temperature and Supply Voltage etc. Activity and log history of network events for specific interfaces such as Ethernet, Serial/USB interfaces, VPN status and statistics. Advanced logging capabilities in XLS format. Import and Export Event Logs. Extensive settings for User Management, Device Access Settings, SNMP, Local Device Discovery. Web Service for centralized upgrades and unit configuration backup and restoration. Customizable SMS & Email Alerts for events.